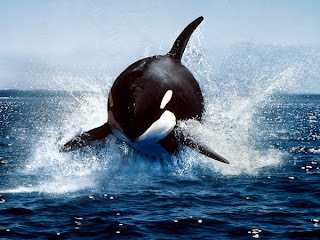 Animal Wildlife | Killer Whale | Killer Whales (orca) are found in all the worlds oceans both hot and cold from the freezing waters of the North and South poles to tropical seas. The killer whale is the biggest member of the dolphin family, and there are about 5 different species of killer whale in the oceans. Killer whales hunt in groups called pods that normally contain from 6 to 40 killer whales. The killer whales hunt larger fish, seal and sea lion and often sea birds and mammals. Killer whales are sadly hunted worldwide for their meat and whale blubber, which is used as an old form of fuel. Due to whaling bans in recent years, the killer whale population can begin to recover again. The killer whale is a dominant hunter but gets it name from the amount of meat it eats rather than having an aggressive temperament. Some killer whales are known to be relatively acrobatic naturally, although the majority are trained in zoos and aquariums. The killer whale has a top speed of around 30 miles an hour but can travel at 26 mph for long periods of time. It is common for killer whale to swim more than 50 miles without stopping. 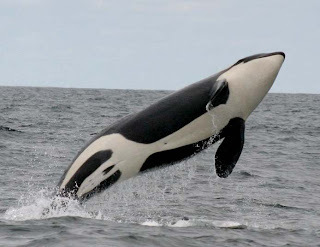 Killer whales are large, stocky animals that have a large dorsal fin, with the black and white markings of the killer whale being their most distinctive feature. 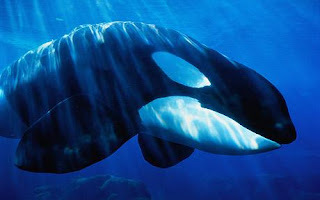 Male killer whales are bigger than female killer whales with male killer whales growing to around 8 meters in length. Female killer whales are slightly smaller than the male killer whales with the female killer whales growing to around 7 meters in length. 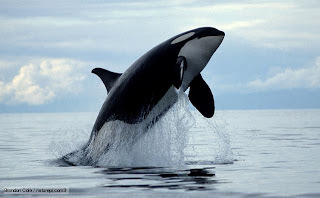 Killer whales today are considered to be an endangered species due to habitat loss and hunting from humans. Although killer whales are not generally seen as a great threat to humans, there have been a number of instances, particularly in marine parks, where the killer whale has attacked its trainer. The killer whale is often referred to as the wolf of the sea, as killer whales are dominant predators and hunt in packs in a similar way to wolves on land. Typically, an average killer whale will eat over 200 kg of food every day which includes over 20 different species of marine mammal and more than 30 different species of large fish. 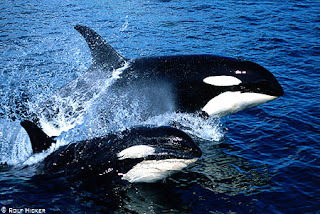 As with their dolphin cousins, killer whales are extremely vocal animals and communicate between one another using clicks and whistles in a process known as echolocation. 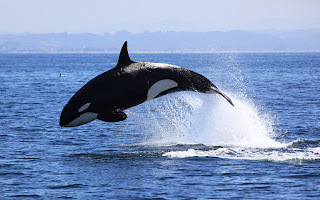 Killer whales are known to at their most vocal and noisy when the killer whales are hunting and the killer whales are much calmer and quieter when they are resting. Killer whales are known to use different sounds when the killer whales are participating in different activities. 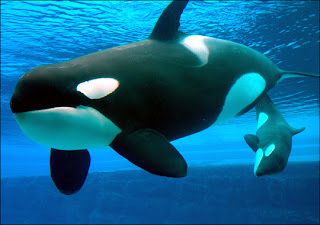 Female killer whales give birth to one baby killer whale roughly once every five years. Female killer whales do not reach sexual maturity until they are about 15 years old, and the gestation period is thought be roughly 18 months long. Baby killer whales are born with a yellowish tint to the white parts of the baby killer whales skin, which fades into the brilliant white colour as the baby killer whale gets older. Mother killer whales look after their calves for the first couple of years of life. Baby killer whales feed only on their mothers milk until they are about a year old, when the baby killer whale will begin to solid food. Killer whales can live until they are 60 years old but this is thought to depend strongly on the will of the killer whale. By means of comparison, killer whales that are kept in captivity will often not live longer than 25 years but in the wild killer whales live for much longer. 0 Response to "Killer Whale"